ESPN, just like everyone else, knew the TV ratings for this year’s College Football Playoff semifinal games would be down from last year’s. But ESPN was still way too optimistic—the games didn’t come close to the numbers they promised advertisers, and now ESPN owes tens of millions of dollars in free commercial spots. Ratings were off about 36 percent from last year, overwhelmingly because they were held on New Year’s Eve, because college football is run by morons. Now, according to Broadcasting & Cable, to make up for the ratings shortfall, ESPN owes brands some valuable free airtime. Talk about a slap in the face to his media partner ESPN which is now some $20 million in the hole because of Hancock’s arrogance, after the network paid the CFP $600 million for the TV rights of the bowl games, including the two New Year’s Eve semi-finals. One buyer is hoping that ESPN, which tried to get the committee to change the date away from New Year’s Eve this season to no avail, reapproaches the committee and makes another attempt for next season. “If I were ESPN, I would have another conversation with the CFP and I would walk into that meeting with some of the major bowl sponsors and advertisers to demand the date be changed,” the buyer says. One ad buyer says at least some of that make-good airtime will come during Monday’s championship game, and that ESPN left some spots unsold for just this possibility. But there’s another problem: the contract for the year’s championship game jacked up the cost for a 30-second spot to as much as $1.3 million, a big jump from last year’s $1 million. With that increased cost came a “sizable” increase in the ratings ESPN has guaranteed. Given the matchups and markets, this year’s championship probably won’t see a one-third ratings boost over last year’s. ESPN could very well end up owing buyers a lot more time and money. In the future, ESPN could lower its ratings guarantees. But it pays $600 million annually for these TV rights, and has to get that money somewhere. This is a disaster, and a totally preventable one. There are a number of reasons the CFP is so set on doing these semifinals on Dec. 31 instead of Jan. 1 (eight of the next 10 seasons will see the semis plays on New Year’s Eve), but none of those reasons can possibly trump the common sense that’s not at play here. Ad buyers hate NYE. ESPN hates NYE. Viewers clearly hate it. College football has to hate it. There is literally less money coming in, and no one has a good excuse. 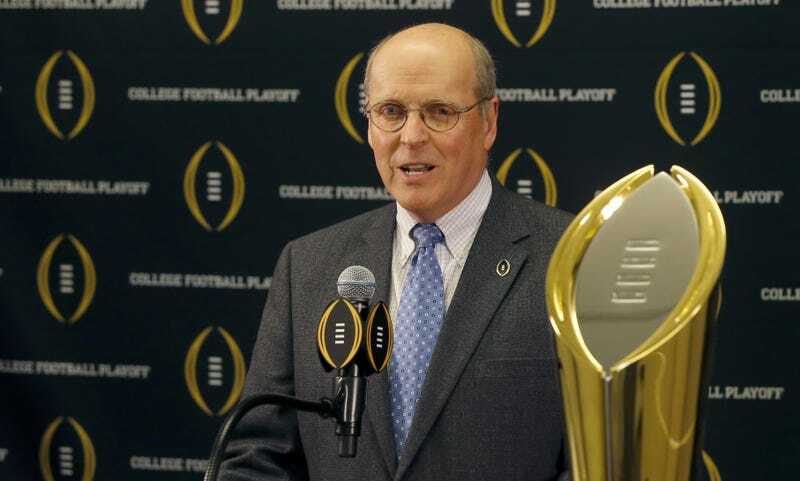 It was smart and good to pick the guy who ran the BCS, which had no problems at all, no sir, to run the CFP.